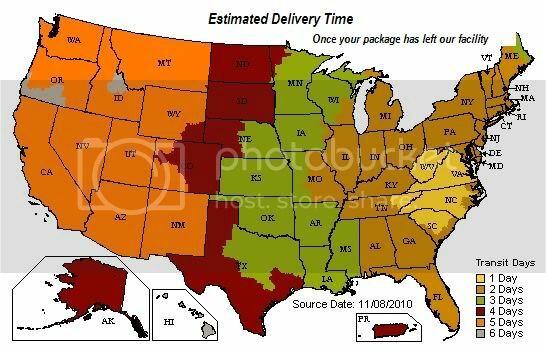 This map will give you an idea of delivery times for Ground Shipping. Most complete orders placed before 2pm Eastern Standard Time will be shipped same day (excluding Federal holidays and weekends). The postal service does NOT consider weekends or holidays to be "shipping days". The above map refers to "business days" only and is meant as a rough guideline. The postal service does not guarantee their ground shipping method. We strongly urge all customers with a deadline to use USPS Express Mail as these orders will have the highest priority in our shipping department. This is the only guaranteed shipping method that the postal service provides. At TAPaulk Communications, LLC we take very strict precautions to ensure that many of our orders are verified in order to guard against fraud. Please note that we do use a credit card authorization system that verifies your credit card number to the billing address that the bank has on file. This means that using an address different than the actual credit card’s address may delay the package and cause us to put your order on hold until we can verify your information. We also ask that if possible, you use the same billing and shipping information for your order. Again, we may be forced to put the order on hold until we can verify all of the information on the order. TAPaulk Communications, LLC will not be responsible for upgrading the shipping or offering a discount of any sort should either of these situations occur. The customer is responsible for ensuring that all billing and shipping information is accurate. We ship all orders via USPS unless the customer has a specific carrier they prefer such as UPS, FEDEX, or DHL. These carriers use the weight, dimensions, and destination of each order in order to calculate the appropriate shipping charge. Please be aware that shipments to international locations can be very expensive, and at times can be more than the order itself. We recommend that any international customers ordering large amounts of products to contact us prior to placing an order for an exact shipping quote. The online system is not able to always accurately calculate the shipping for larger orders. There may be instances where one of our Customer Service Representatives will contact you after your order has been placed in order to verify any changes in the shipping costs. The customer is responsible for all shipping costs. We primarily ship packages via USPS. Complete orders will typically ship the same business day as long as they are placed before 2 PM EST. While we make every attempt to ship the day of your order, there is no guarantee of this. We also cannot guarantee that your package will arrive in any particular time frame. There are instances where USPS will delay the shipment of a package due to unforeseen events. If your package has been delayed beyond its scheduled delivery time, we will not be able to refund any shipping charges. Please be aware that USPS does not have any guarantees as to the delivery time of any mail type other than Express Mail. Free Standard Shipping to U.S. addresses is offered on all orders of $49.99 or more. Qualifying orders shipping within the continental U.S. must choose USPS First Class Mail on the checkout page to receive free shipping. Orders to Hawaii, Alaska, or APO/FPO addresses that qualify for free shipping must be shipped via USPS, otherwise, free shipping will not be granted. Please note that if you attempt to obtain free shipping on an order that does not qualify, your order will be cancelled until we notify you and receive authorization for the additional shipping charges. Free shipping promotions do not apply to international orders. Should a package be lost or damaged, it is the customer’s responsibility to report the loss to TAPaulk Communications, LLC so that the problem may be addressed in a timely manner. Lost UPS packages must be reported within 30 days of the original ship date of the package. Lost USPS packages must be reported within 45 days of the original ship date. The postal service will not allow us to open a USPS claim before 45 days from the original ship date. If you feel that your USPS package has been lost, you must submit your concerned in writing so that we may open a claim with the postal service. Please be aware that claims cannot be opened after 90 days, and TAPaulk Communications, LLC assumes no responsibility for claims made after these time periods. If your package is shipped via USPS, your package doesn't contain insurance and TAPaulk Communications, LLC will not be held legally responsible for any lost, damaged or stolen packages. We recommend purchasing insurance for all packages and this can be done by emailing us prior to placing your order. Once a customer advises TAPaulk Communications, LLC of a lost package, TAPaulk Communications, LLC shall wait a period of no less than three weeks to determine if the package is indeed lost or has only been delayed in it's travel. Once the three week period is up, TAPaulk Communications, LLC will reship the order as long as the delivery confirmation (tracking number) doesn't show an updated status such as delivered, in route, returned to shipper etc. If you have any other questions regarding our shipping polices, please don’t hesitate to contact our customer service team at info@tapaulkcommunications.com or visit our Live Chat feature.